Unfortunately, there is no way around doing your taxes. You either need to do ‘em yourself OR get someone knowledgeable enough about tax law to do them. To top it off, you want to make sure they are done right. All 19 tax returns prepared were wrong to some degree and only two preparers correctly calculated the right refund amount. So, how can you make sure you are getting your taxes done correctly? The New York Times did a story where they cited that the “typical” American family constituted a husband, wife and two kids living under the same roof. While our situation is a bit more complex, we aren’t running a corporation or doing any day-trading activity. Tax law is always changing. Every year it seems there are new changes or tweaks to the tax code. I certainly can’t keep up with these (nor do I want to). For me, it boils down to two choices: going to a tax pro (which I’ve done in the past with varying success) OR filling out my taxes for free (or for a nominal fee) online using tax prep software. The issue that I’ve run in with tax professionals is they are typically very busy during tax season. I like the tax pro that we’ve seen in the past – but I always got the sense that she was rushed for time and our situation didn’t get the appropriate attention it needed (plus, our taxes were “handed-off” to a junior person at the firm). This is why I typically opt to do it myself using online tax prep software. The beauty of doing it oneself vs. going to a tax preparer is that you know your situation the best. Programs like TaxACT make filing a breeze. They walk you through the whole tax prep process to make sure you don’t miss any deductions you may have otherwise qualified for. I think this is well worth the extra fees. 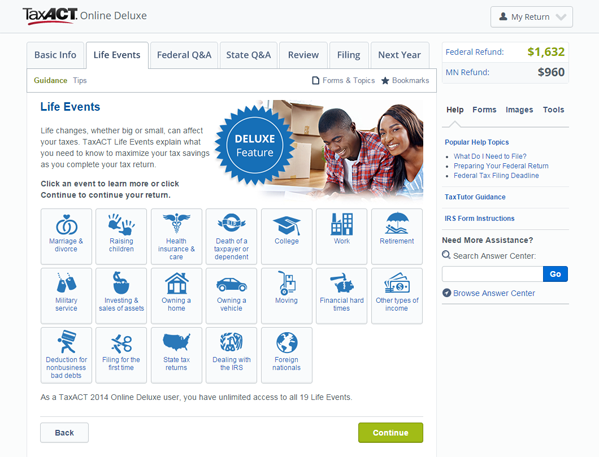 Do you usually file your taxes online? This article was brought to you by the fine folks at TaxACT. All opinions expressed are our own. The statistics on tax professionals preparing correct returns are a little bit troubling. Touching base with tax accounts long before deadline day is important, to make sure their files include the ins and outs of your return. One of my goals in life is to have taxes that are so complicated that I can’t do them for myself, which also gives me an excuse to never try any of the software and just hand them over to a specialized accountant. I’ve been very happy with TurboTax deluxe, but this year I switched to H&R Block. My friend used it with no problem last year. TT Deluxe no longer handles Sched D and some other forms it used to do. They force u into high priced premium upgrade after u buy it once u discover the change. Hopefully they will lose enough customers that they will go back to those forms in Deluxe next year. I’ve been using Turbo Tax for the past few years and have generally been happy with it. Unfortunately, it’s pricey — I’ve had to use the deluxe version — and Turbo Tax has been in the news of late for essentially forcing deluxe users to upgrade to a pricier package (though I think Intuit just decided to reverse their decision on this). I though about switching to TaxAct last year, but didn’t — I’ll probably do it this year, though. The transition will probably require some extra work but the money saved should be worth it. Since I’d be filing state, it looks like the difference between the free and the deluxe is only $5 — think that makes the deluxe a no-brainer for me. We hope you make the switch Ruser! TaxACT is a lot easier on the wallet than the others and is simple to use. I have been using TurboTax for years & have really liked it. The only time it wasn’t accurate was when I had two part time jobs.. not sure if that was my error or the software but I had to pay in additional taxes in 2014 year to make up for the mistake back in 2012… Here is a question I have, does anyone know how to account for mortgage payments when two unmarried adults split the mortgage payments? I have not found an answer to this online. Thanks! Hi Savannah. Since we aren’t tax professionals – we asked one. Please see the attached tax document that should be able to answer your question.